Watch Now: DEPO's "Never Be the Same"
Brooklyn make some noise. Really.. make some noise! In case you missed it last night, the Brooklyn Nets and the Toronto Raptors squared off in a pivotal Game 5 with the series tied 2-2. The Nets were down three with seconds to go and forward Andray Blatche ended the game with an unnecessary and costly turnover to give the Raptors the win and the 3-2 series lead. The Toronto crowd has been one of the coolest stories of this years spectacular postseason. From their massive crowds outside the arena watching the games on the big screen, to their raucous and intense crowd inside the Air Canada Centre, Raptors fans are giving the Golden State Warriors fans a run for their money for the best NBA crowd. The Nets twitter account took this opportunity to call out their own fans during the early stages of last night’s game in Toronto. After showing up late to Game 3 and not really being much of a factor in either Game 3 or 4, the Barclays Center crowd is on notice. 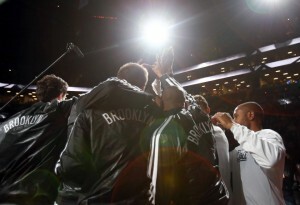 It’s time for Brooklyn to step it up and make this elimination Game 6 a true playoff environment. They will need to bring the noise at Barclays tomorrow night with the Nets season on the line.